1894 was a particularly bad year for France although its problems were experienced by much of Europe and to a lesser extent the United States. Anarchism was becoming widely accepted by the downtrodden classes as the only solution to the vast inequalities in society. Anarchists believed that government was both harmful and unnecessary as society without government would “self-regulate” on principles of natural order while government always led to tyranny of the wealthy and landed classes over the lower classes. 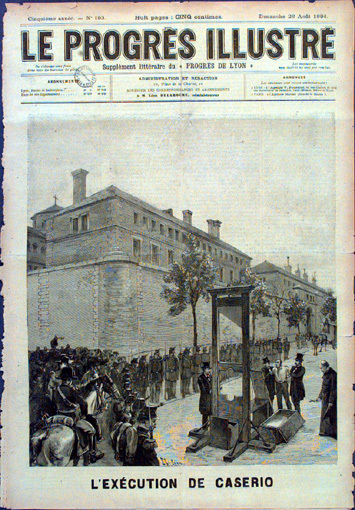 Radicals in the movement turned to violence which reached a peak in France in 1894- an Italian anarchist, Sante Caserio, assassinated French President Sadi Carnot and was quickly tried and marched to the guillotine but anarchists also bombed expensive restaurants in Paris, killing wealthy patrons, much like the Paris terrorist attacks of this year. Anarchists in 1894, of course, had access to only cheap revolvers and crude explosives but had they had the access to the weapons and explosives of today the death toll would have been far higher. Months later a British anarchist attempted to blow up the British Observatory but in this attack the only casualty was the anarchist. However anarchists weren’t all incompetent, an anarchist murdered Czar Alexander of Russia and a few years later an anarchist assassinated our own President McKinley. It wasn’t until the First World War that violent anarchists became less a threat to the richer societies. Dead presidents and wealthy diners no doubt preyed on the minds of Parisians in 1894 but the most distressing national crisis of the year involved spying, in particular the passing of French military secrets to the hated Germans. The alleged culprit, a French Jewish artillery captain named Alfred Dreyfuss, was soon arrested and hastily tried by a military tribunal. Dreyfuss, seen above addressing his accusers, was summarily convicted on very flimsy evidence which itself had been crudely fabricated and given a life sentence on Devil’s Island. 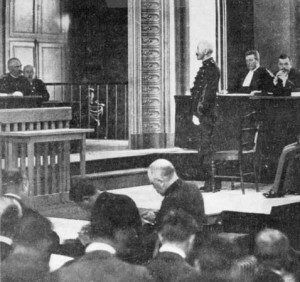 The rush to judgment outraged French society and the world but Dreyfuss spent 5 years on Devil’s Island before being exonerated and then only after the fellow officer who had forged the incriminating documents confessed and committed suicide and the real traitor, a Major Esterhazy, fled the country. In 1898 Emile Zola, the renowned French author, published his famous letter J’Accuse in a Paris newspaper condemning the government and the army for its conduct in the Dreyfuss case and was promptly sentenced to a year in prison. He fled to England where he lived until public opinion finally turned against the government and the army. 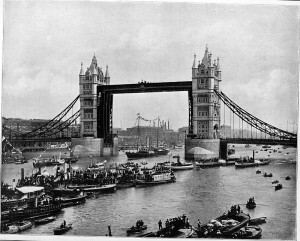 London’s iconic Tower Bridge opened in 1894 and still delights millions who visit London yearly. 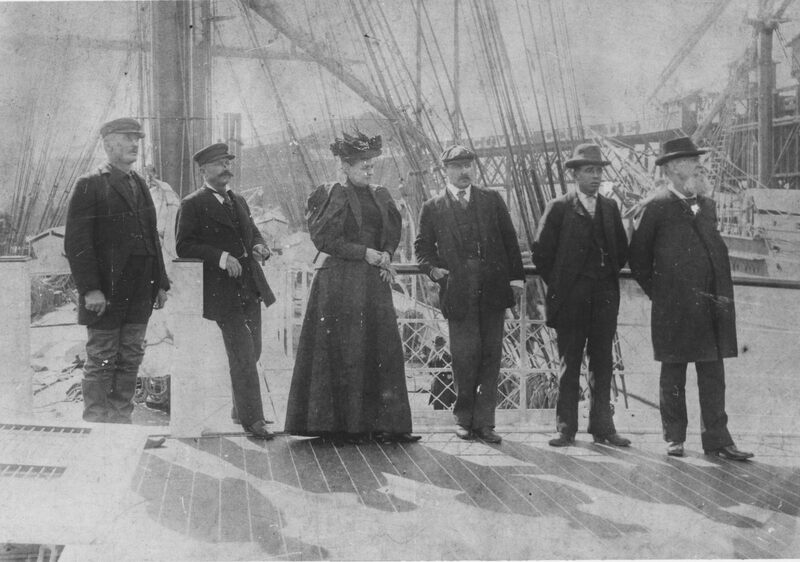 The ship had a very close Calais connection as its first and only captain from 1894 to 1909 was George Goodwin one of Calais’ finest mariners. He is second from the left in the photo above. Capt. 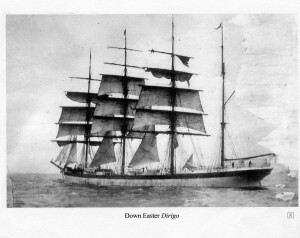 Goodwin sailed vessels built and owned in Calais for many years before taking the helm of the Dirigo. In 1895 C.F. 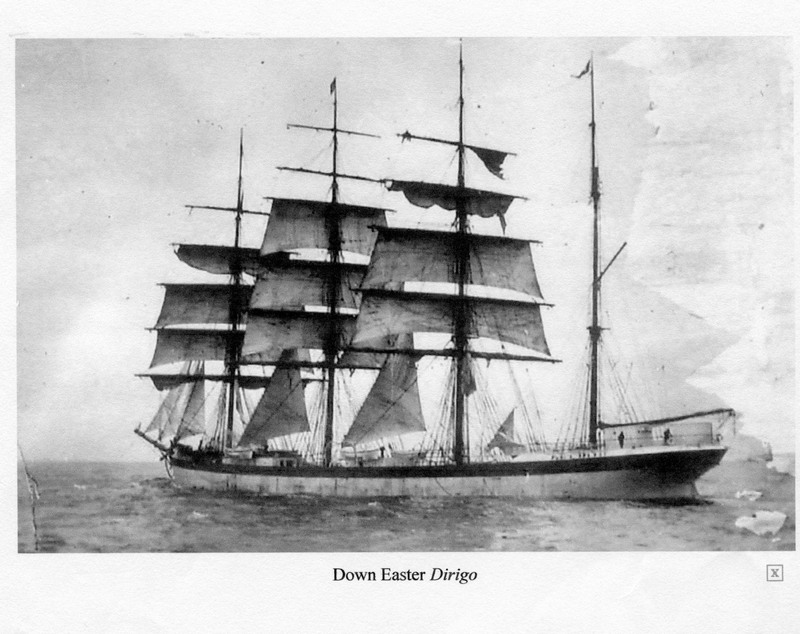 Murchie, a young man from Calais, sailed around the Horn with Captain Goodwin on the Dirigo to San Francisco. 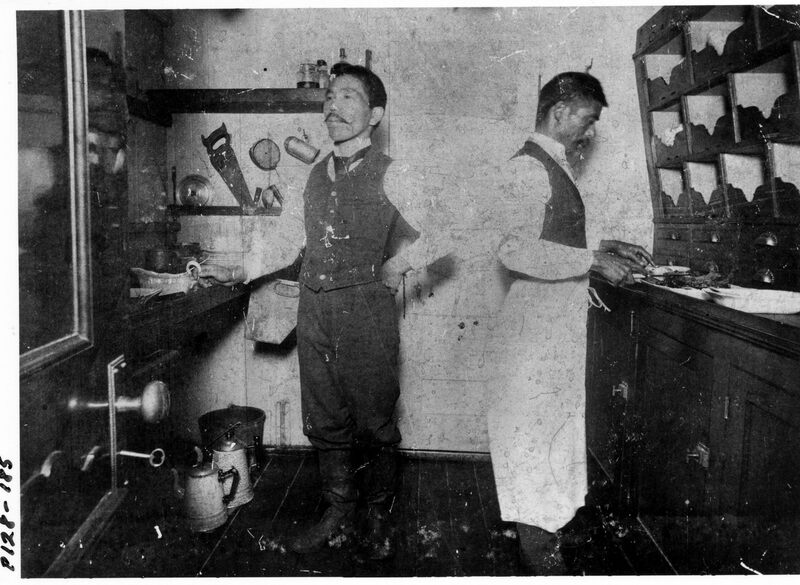 He kept a diary which we have in our collection.In the third photo above the two ships cooks work in the ship’s galley. The new Calais Library opened in 1894 to great excitement in the community. Prior to the building of the library an informal reading society had existed in Calais from the early 1800’s. 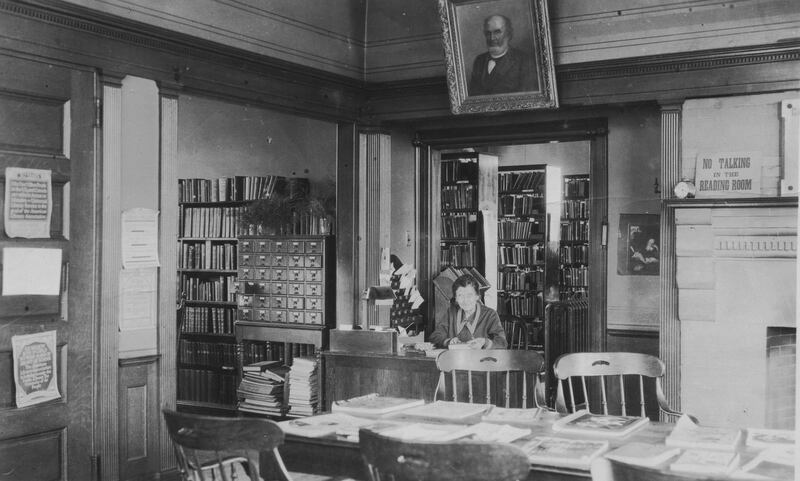 By 1894 the society had collected 3600 books which the society donated to the reading room of the library on January 31, 1894. The reading room photo is from 1935 when Ruth Boyd, pictured, was the librarian. 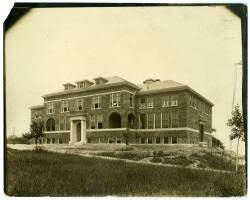 The year 1894 saw a number of Calais girls committed to the Maine Industrial School in Hallowell. 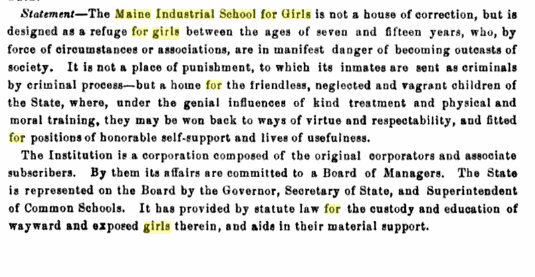 Contrary to the tone of the mission statement of the Industrial School, the girls who were packed off to Hallowell were not school skippers or slightly rebellious teenagers. 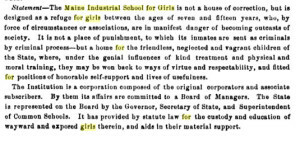 The offenses for which a young lady was sent to the Industrial School included “Being In Danger of Falling into Habits of Vice and Immorality”, leading a “Vicious and Vagrant Life” and Nightwalking. Not only could the authorities dispatch a girl to the school but parents were allowed to have them committed. We suspect this threat would be at least comparable to taking away the smart phone. 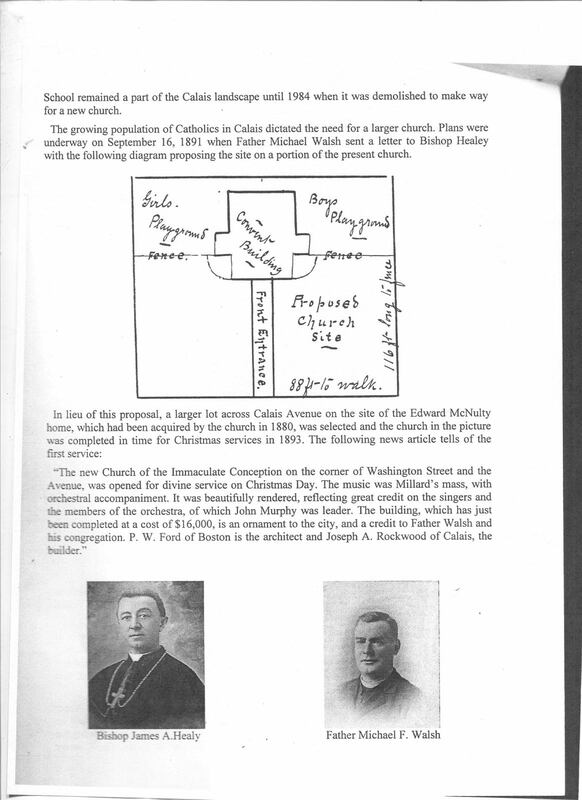 1894 saw the first mass at the new Catholic Church at the corner of Washington and the Avenue. Interestingly the above document shows the church was originally to be built on what became the front lawn of the Parochial School. Plans changed when the church acquired a lot on the adjacent corner for the church. 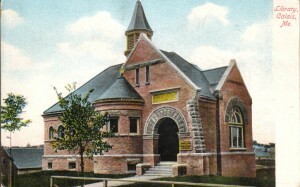 The original Catholic Church was on Union Street. 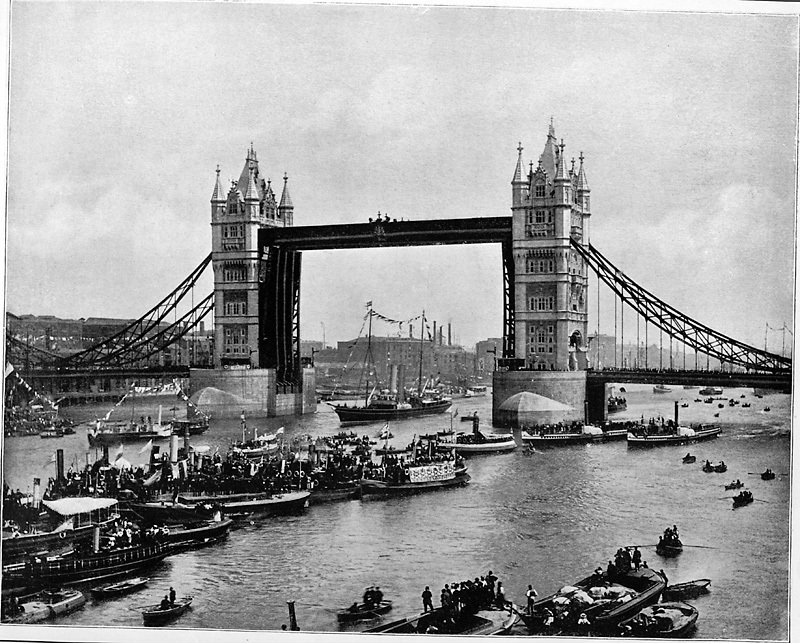 Finally 1894 saw the beginning of streetcars and the free bridges in Calais. This photo shows work crews installing the tracks on Main Street in Calais. 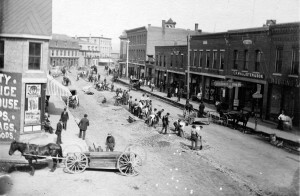 The wagon in the foreground is at the corner of Main and North Street. Carole’s bookstore is now located in the 6 windowed brick block to the right. The brick storefront to the far right was recently Maineline Studios.